Very few things speak of Italy to me than a perfectly baked Pizza. The thought of a wonderfully crispy and thin crust, so masterfully stretched and folded to create the perfect base for our favorite mediterranean combination of fresh tomatoes, mozzarella and a few other usual suspect, topped by a drizzle of top-notch quality extra-virgin olive oil, is enough to send me delirious and wish for a scalding slice of Margherita straight away. My most luxurious culinary vision is a happy face stuffed with Neapolitan-style pizza, melted mozzarella dribbling down my chin and all! Neapolitan-style pizza could not be farther from those doughy, rubbery, gummy disks of dough fried in lesser fats and topped with a cornucopia of ingredients that we Italians have never even heard of…Can someone please enlighten me on what Pepperoni is?? 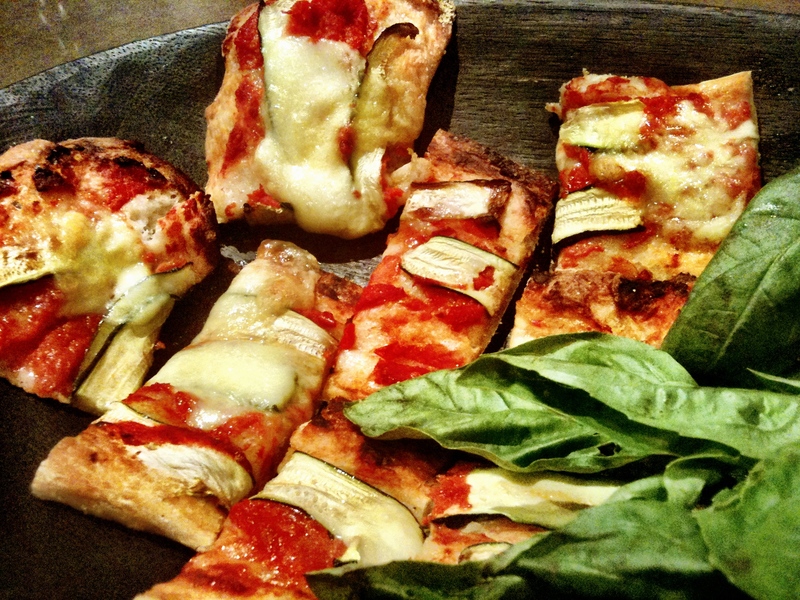 No, pizza, Italian pizza, is light, delicate and accommodates only a few ingredients on top. It is gentle on your digestive system because of the slow-fermentation of the dough and it, by all intents and purposes, good for you. So, get your flour and start kneading! Extra-virgin olive oil, to grease the bowl and to drizzle on top. Dissolve yeast and sugar in water. Stand for 5 minutes or until frothy. Place flour in a large mixing bowl, add the yeasted water and mix for 1-2 minutes, then tip the dough onto a floured surface, add the salt and knead vigorously for 10 minutes or until the dough is smooth and elastic. Shape it into a ball. As all flours tend to differ slightly, you may have to add a little more water of a little more flour in order to have the perfect dough. You want a soft, pliable dough, but not too sticky. Rest the dough in an oiled bowl, covered with a tea-towel for 30 minutes, then lift it out, place it back onto a floured surface, stretch it with your hands and fold it into three and then back into a ball. Put the dough back in the bowl to rest for another 30 minutes, then stretch and fold again. As tedious as this process sounds, this is paramount for obtaining a light, crispy and easy to digest base. After the second stretch-and-fold, place the dough in a large oiled container fitted with lid (like a Tupperware one). Place in the fridge (with the lid on) and slow-prove for a minimum of 6 hours, up to 36 hours. When you are ready to make you pizza, take the dough out of the fridge and place it in an oiled bowl and cover it with a tea-towel. Rest at room temperature for 30-45 minutes. Your dough is now ready to be stretched, topped and baked. Pre-heat your oven to 220 C, 425 F.
Roll it out to your desired thickness, keeping in mind that it will rise a little while baking. If you plan to use a pizza stone, place it in the oven now to heat up. Dust it with coarse semolina to prevent the dough from sticking. I normally roll the dough and place it onto a sheet of baking paper. It easier to carry to the oven and you can slip the paper off the stone 15 minutes into baking, to allow the base to crisp up nicely. Top with tomatoes, salt, a drizzle of extra-virgin olive oil and whatever you love more, keeping in mind that, less is more… I have a personal love-affair with anchovies, capers and olives. If you plan to add cheese, do so only for the last 5 minutes of baking, or it will dry out. You pizza should take 20 minutes to bake, but since all ovens vary, check it after 10 minutes and judge for yourself. Take the pizza out of the oven, top with basil or rocket leaves, if liked, a drizzle of extra-virgin, and , Ecco, (there it is!) your authentic Pizza Napoletana is ready. come sempre anche le foto sono belle! Ma brava!!! Grazie!Prova anche tu a fare la pasta di pane con farine diverse, vedrai che differenza! Mouth-wateringly perfect! And agreed, less is more. Do you cook Italian often? In our house if it’s Italian I cook it but I only know the way my mother taught me, otherwise my husband is a brilliant cook and I am very spoiled! How lucky for your husband you can cook authentic Italian to him , but also, how lucky for you to have a hubby who is handy with pots and pans..especially if he does the dishes too! Love seeing the different recipes for bases. Thank you. We have a woodfired oven, and I used to let people put on their own toppings. It was a huge fail. Now I do it all, and get rave reviews. To the point they are asking when i will open a restaurant. Yes, and thank you for spotting it! How funny. Please, let me know how you go! Hi Silvia! What is whole meal flour? Where can I find oo flour. I use King Arthur’s white flour. Hi Joanne, I think in the US it it referred to as whole wheat flour. Looking at your pizza makes me hungry! My boys both react badly to dairy foods and in your post you indicate that adding cheese is an option. What topping ideas do you have for a cheese-less pizza? Also I usually substitute lard for butter, but if a recipe calls for milk I choose a different recipe. Do you have any substitution ideas? I make a lovely chocolate cake using olive oil, but many of your cakes, that have long been family favourites, use buttermilk. Any suggestions would be hugely appreciated. Thanks Silvia. I have used coconut milk in lots of recipes and it is fabulous. It gives a lovely rich flavour and great texture. I never would have considered substituting buttermilk for fruit juice but I can’t wait to try! Will try your cake recipe tomorrow and let you know.